The shag is nice quality and plush. We are very happy with purchase and would definitely purchase another rug from this brand. Renew your interior decor with this plush Quinn shag rug from Strick & Bolton. The charming rug is machine-woven from polypropylene to create an attractive but durable design. The rich colors complete the simple but lush appeal of this elegant rectangular rug. Dimensions 33.0 In. X 8.0 In. X 8.0 In. 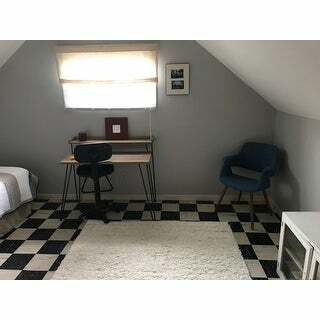 The rug is overall very nice for the price. It is able to withstand frequent vacuuming and 2 dogs that love it. I was slightly disappointed that the sizing was a bit off but not a real problem for me. As for the shade variation, I actually purchased it because others stated that it was off white which is what I was looking for. I also purchased a thick pad which I would highly recommend. This rug was ordered for a nursery and it feels great underfoot either with shoes or barefooted. I was happy to see the color and plushness lived up to the picture and description and that the workmanship is finished on all edges and the underside. I would recommend this product and would purchase again. I bought this rug in white and wow so amazing! It's very soft, thick,fluffy and beautiful! NO SHEDDING AT ALL!!! The white color is very accurate. It brightens my family room! I will be purchasing another one in cream for my living room! Very satisfied with this purchase! thank you Overstock! this rug would have gotten 5 stars if the color displayed online were the color of the actual rug. i ordered the glacier blue, which appears to be a light blue/silver tone in the picture. this rug is more teal than anything. not at all as expected. this is the 3rd time i have received a rug from overstock where this was the case. the first 2 i sent back. this one i am keeping and trying to make it work simply because i am tired of losing out on the cost of return shipping. again-the rug itself is great and a bargain, but the unexpected color is a true bummer. I read all the reviews before buying, and shopped around - I will attempt to address the issues in the negative reviews: color: I ordered the Salt & Pepper color - one reviewer said it was actually black, and labeled as such. It is indeed labeled black, and slightly darker than the picture, but it has a gray appearance. It is made up of half & half black and gray threads, hence, salt and pepper. thickness: This to me is more about the type of shag than the quality of the rug, for the length of shag, which I wouldn't want any longer, it feels appropriately thick - I used it with the non-slip pad (not the rubber mesh type) and it is on a wood floor. There is nothing about this product that seems cheap, or thin - however, I don't have any experience with a top quality shag rug. comfort: the shag is very comfortable, not at all scratchy, yes I rolled in it as I have never had shag before and it seemed the right thing to do and it feels very nice. quality: From my in-store shopping, when you find shag at this price-point, it is more like a bath mat. Nothing about this rug is like a bath mat, the shag is soft, and dense yet loose - exactly as you would want it. It does not look or feel like a cheap product. shedding: none yet, had it for a week but I am the only one to have been on it so far - we will see after the house warming party. odor: none. arrival time: it took 6 days including sat & sun. Well first of all I was debating between a flokati but didn't want to chance the shedding. In saying this was the overall modern look I wanted in my living room. It arrived and the color is white. It's a fair rug since I purchased it during a sale and using my o rewards it was about 130. For the price it's a great rug. Not sure if I will keep this rug in the living room long term only because I want something more expensive looking. With kids this works for the mean time. It is also fair in the softness department. I think down the road I might move it into a guest room, I think it would look great in a bedroom of some sort. 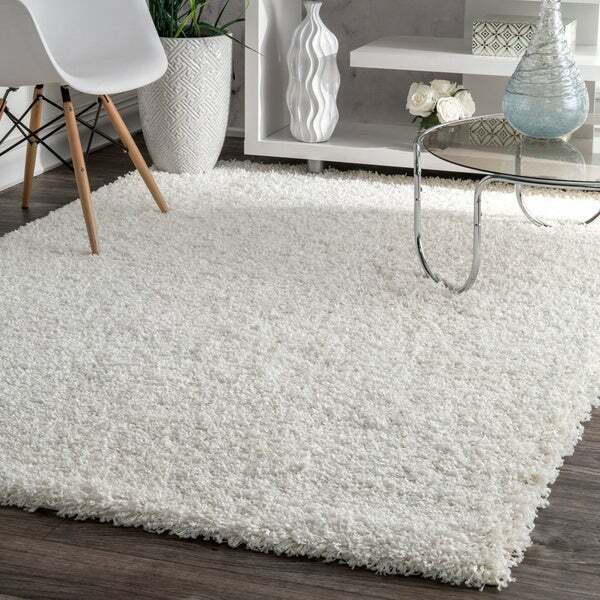 Overall I'm satisfied with this rug, I think the thing you must know when buying this rug is you cant compare it to a high end, because it's not. I have read many reviews on this rug and others and people don't understand that you can't expect to get a $1000.00 dollar rug for a couple of hundred dollars. I think if you keep this in mind you will love this rug. I even looked in stores and most rugs in this price range were super rough and hard. This is soft compared to others in this price point. Also I have not had a any problems with shedding which was also a big concern when purchasing. Love Love Love this rug!!!! I bought this rug to go in my dinning room under a black round table with four gray and gold chairs on top of a white marble floor. I was worried if this rug would give me the look that I was trying to achieve. Pleasingly surprised, this rug completed my look. It is beautiful. The cost is what I was worried about, because of the largeness of the rug , the low price and the fact that I had been pricing 8" round rugs at high end stores and the price was 3x what overstock price was, I was somewhat undeceive about purchasing this rug. However I have had this rug for about 4 months and I could not be happier with it. The color is a smokey gray with black high light to it. It may look black to me because my black table is sitting on top of it. It was big enough to support the table and four chairs and still have about 7 inches of the rug overlapping. The shag is about a inch thick, however because of it being role up, the edges stick up and the center of the rug has a bubble in it. This is easy to fit and if you are like I was, looking and looking for the prefect rug. You will take the time for the look to be prefect. I took several bricks and place them on top of the edges, then I took my 2 inch thick round glass top off my table and put it in the middle of the rug and left these things there for 3 days and the rug flatten out. Now it lays flat with no edges or bubbles sticking up. If you are thinking about this rugs, get it,- you will love it as I do!!!! Prefect- absolutely beautiful. I have had this rug about a month and it is in my living room which is used heavily. I ordered the cream color and it is beautiful--has more depth than I expected. The shag has very slight variations of cream which make the color appear richer. Its gorgeous. The pile is soft and thick while still being a pretty shag---not too tightly woven and not to sparse. I have experienced very little shedding on this rug. I have furniture on the rug and when I move the furniture (coffee table and chairs) it does leave an imprint in the shag but that disappears as soon as I run my hand through it. I ordered a rug pad from overstock to prevent the rug from slipping on my pergo floor and it works perfectly. With rug pad, the shag rug is plenty soft and cushy under your bare feet. I really love this rug and I would order another on in a heartbeat if I had a place ot put it! Very nice rug. Very good price. I almost didn't order this rug because of some of the negative reviews. I don't get it. Unless completely different rugs are being sent out to the various buyers - I can't explain the negative remarks by some of the other buyers. First: Shedding: I checked this right away - before even removing it completely from the plastic wrap. There was no shedding. You can also tell by looking at the plastic wrapping. If the rug shed excessively - the fibers would be all over the inside of the plastic wrapping. None. Second: Softness of the weave. For the price - I wasn't expecting too much honestly. But the weave is hardly "rough" or "course" like other reviews have indicated. These people must have extremely sensitive feet. The softness of the weave feels fine to my feet. Lastly - Thin Pile: When the rug is first unrolled from the packaging - the pile is flattened or compressed to the rug backing. I know enough about basic physics to know that this is due to the rug being shipped rolled. I just spent 5 minutes using my feet to brush the weaves back upright. Looks full and perfect after doing that. To round of my review: I got the orange rug and the color and thickness of the weave looks identical to the pictures. The only thing I had to do other than brushing the pile to get the weave to stand back upright was to put some heavy books all along one edge until that edge flattened out from being rolled up for shipping. Overall - very nice rug at a very good price. Don't let the negative reviews prevent you from getting one. I'm getting cream or white one for underneath my bed. Enjoy. The rug is beautiful, but it's not as luxurious and thick as others I have seen. However, it is also much less expensive than other shag rugs elsewhere. The smell is terrible, but am hoping that it goes away soon. Also, the edges are very "raw" and look old and shattered. The rug is on the thin side and is definitely not white--more of an antique/ivory white. I bought it for my daughter's nursery and am satifsfied vis a vis the price I paid. I had purchased this rug, and when I received it, I was so bummed! I was expecting something much thicker, soft, and plush. The fibers were coarse and stringy looking. I never unrolled it, but the color is nice. It'd be a good rug for a room that's hardly ever used. I ordered this rug in October 2010. I received my recently placed order today for the 5x8 version and it is a completely different rug in color quality and backing. It is being returned and KUDOS to Overstock for their assistance in the process. This rug is not even close to what is described. The shag is barely 1" not 1.5" as labeled. It does not even come close to being as thick as the pictures. The label on the underside say it is made by Bogoshaggy. When standing on top of it you can see thru the shag to the matting. If I was not having furniture delivered, that was going on top of it, the next day I would have returned it. It is an ok rug but it is not what I was expecting. This is a cheap, poor quality rug. Its in not very soft under the feet. And it is so finely woven that you can actually see through it and see the mattress pad underneath. The only reason I am not returning it is b/c I dont feel like spending $50+ dollars to send it back. Its under my bed in my bedroom, so I can deal with it. I guess you get what you pay for. I am usually very pleased with overstock items, but this is not what I expected. Save your money and buy something else. Stuff does get trapped in the Shag, but I like it still. Great white rug to add -- it was thinner than I was hoping for so it isn't a very plush rug. You can certainly fluff it a bit so it looks fuller, but if you want something comfortable to sit on frequently -- look elsewhere. This rug is a terrible quality. Fibers are sparse and we had to replace it after less than a year despite being in a fairly low traffic area. Looks very matted and cheap unfortunately. This rug is very thick and plush. I ordered it in navy and it is a true deep navy color. "Is the rug listed as "5'" a circular rug, or a square? I'm looking for a circular rug." This is a circular rug, we apologize for the confusion. "in the set of pictures, whatever color is #16?" The 16th image is the silver color option. We recommend the use of a non-skid pad to keep the rug in place on smooth surfaces. "What's the difference between the listed "silver" and "grey" colors? The pictures don't clarify which one is which." The silver options has a lighter tone. "What is the fiber in this rug?" This item is constructed with Polypropylene synthetic fiber. "Is there a picture available for the goldenrod and is it more of a yellow or gold?" The golenrod is more of a bronze gold color. "Why does your description say navy rug but it is listed as grey?" Thanks for bringing this to our attention. We will have it updated shortly.